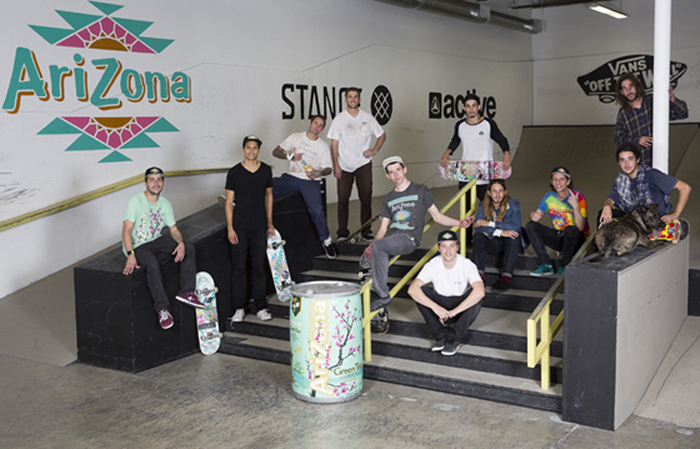 TRANSWORLD SKATEBOARDING is proud to welcome AriZona Iced Tea as the new Presenting Sponsor of the world-renowned TRANSWORLD Skate Park. With the new partnership comes a fresh new look in the park, complete with an updated color scheme and brand new features that enhance the modular nature of the park and allow for even more ways to tweak and customize the layout. In addition to the facelift, guests to the TRANSWORLD Park will now be able to quench their thirst with a variety of new teas, juices, and energy drinks courtesy of AriZona. AriZona will also be the Title Sponsor of TRANSWORLD’s most popular web video franchise “Afternoon In The Park.” Look for the newly assembled AriZona Skate Team to be featured in their own AITP this December on twskate.com.